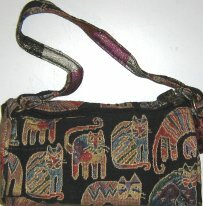 This little Laurel Burch cat purse features her famous design - Fantastic Felines. The quilted tapestry purse is lined and it features one zippered inside pocket, one 21" handle and her signature zippered closure. The purse is 8 1/2" wide x 4 1/2" high x 2 1/2" deep.